END OF THE LINE OR NEW BEGINNING? 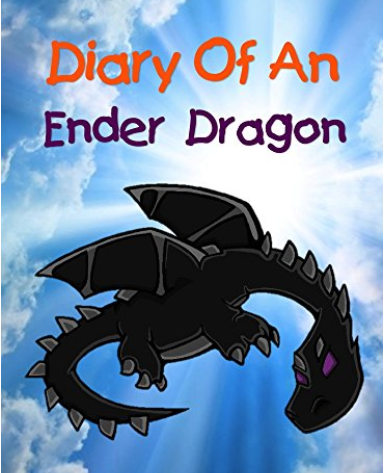 This beginning chapter book narrates the adventures of Ender Dragon, who has been appointed by the ruler Notch to guard the End dimension in the Minecraft game. His life is usually boring, but one day a human named Steve arrives with his sword. After Ender is wounded, he strikes a bargain with Steve. Ender will show Steve the way to the portal which leads to the outside portal. Ender and Steve are about to embark on an adventure that neither of them will forget.Ender details their adventures in a diary that takes place over the course of a week’s time. Both discover parts of themselves as their lives are changed forever. Fans of Minecraft will enjoy the book, but the book does not focus on the game, but rather the interaction of human and dragon personalities and capabilities. At less than fifty pages, the book is an easy read for beginning readers. Because the chapters are short, it could also be used as a read aloud. Recommended especially for readers in the seven to ten age group. If you enjoyed reading this post, please subscribe by clicking on the word Follow or by hitting the orange RSS FEED button in the upper right-hand corner of the page. Happy to introduce you to it! Joyful holidays to you and your family as well.